Bleeding gums are one of the most common signs that something is wrong in your mouth. While we may brush bleeding gums under the rug and assume we were just brushing or flossing too aggressively, healthy gums shouldn’t bleed very easily. If you’ve noticed a bit of blood in the sink after brushing your teeth, there may be an underlying health condition causing it. To maintain your oral hygiene, you will want to find the source of the bleeding and do what you can to eliminate it. Here is what you can do to better understand why your gums are bleeding and some ways you can fix that problem. There are a few different reasons that your gums may be bleeding. Each source of bleeding gums will need to be treated a different way, so it is important to find the unique reason your gums are bleeding and treat it appropriately. Bleeding gums are usually not something that should cause serious alarm. However, in order to prevent a more serious condition from appearing, you will want to react appropriately and solve the underlying problem. To know how to get rid of your bleeding gums, you first need to know why your gums are bleeding. 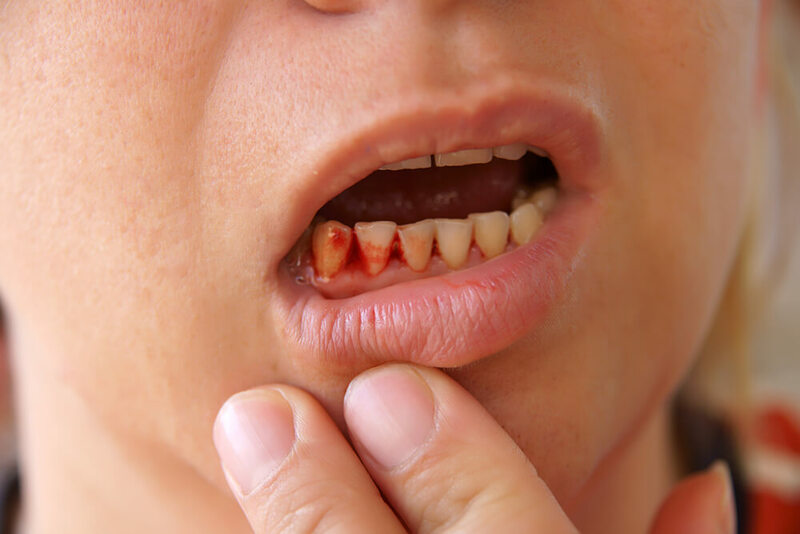 Here are some of the most common reasons your gums may be bleeding. Your gums may be taking a beating if you’re brushing too hard or you’re using a toothbrush that is too strong for your gums. Many people seem to be under the impression that the harder they brush, the cleaner their teeth will be. While you may be removing the bacteria from your teeth and gum line, you’re also causing damage which can cause discomfort, pain, and bleeding. Take a look at your toothbrush to tell if you’re brushing too hard. If the bristles are bent or frayed, you may be pressing too hard on your gums. While you need to use pressure to effectively brush your teeth, it should feel more like a massage than a pressure washing. Try to ease up on the brushing or purchase a toothbrush with softer bristles and see if the bleeding stops. If your gums are still bleeding without brushing, there are other issues to consider. While you may not want to believe you have the beginning stages of gum disease, gingivitis is one of the most common reasons for bleeding gums. Gingivitis causes your gum to bleed because plaque and bacteria causes swelling and infection in the gums. If you ignore bleeding gums caused by gingivitis, you may progress into the more advanced stages of gum disease. Serious consequences, including tooth loss, can develop from more advanced gum disease. To effectively remove and treat gingivitis, practice good brushing and flossing habits. Certain medications thin your blood, causing you to bleed easier. Even common over the counter medications like ibuprofen can cause your blood to become thinner. If you’ve noticed that your gums started bleeding around the same time you started a new medication, the new drug may be at fault. Talk to your doctor or dentist about the bleeding gums you’re experiencing and that you think it is related to the medicine. They can help you develop an oral hygiene regimen that keeps your teeth and gums healthy and clean without contributing to your bleeding. Flossing is recommended for all individuals for keeping their teeth, gums, and mouth healthy. But if you’re new to flossing or you’ve missed a few days of flossing, you may notice that flossing causes your gums to bleed. The more your gums get used to flossing, the less likely they will be to bleed. While the blood may be alarming at first, it should stop after a few days of flossing. You may have additional bleeding if you are flossing and have gingivitis. However, flossing is a great way to clear up gingivitis and restore oral health. Many woman experience bleeding gums while they are pregnant. Because of the change in hormones that comes with being pregnant, you may be more susceptible to developing gingivitis. During your pregnancy, you may need to take additional steps to maintain proper oral hygiene. Regular brushing and flossing should be enough to keep the gingivitis at bay while pregnant. While these are not the only reasons for bleeding gums, they are some of the most common. Look for factors that may indicate the reason behind your bleeding gums. In most cases, bleeding gums are a sign that you’re not taking proper care of your teeth, gums, or mouth. If you practice consistent strong oral hygiene skills, your bleeding gums should go away on its own. Brush and floss regularly and consider adding a water pick or mouthwash into your oral hygiene routine. Try to brush more softly or purchase a new, softer toothbrush. If your bleeding gums do not go away or ease up in a few days or a week, you may want to consider what else could be causing the irritation. If your gums do not stop bleeding with proper at-home treatment, you’ll want to visit your Las Vegas dentist. Your dentist can help determine if there is an underlying condition that needs additional attention. Bleeding gums can be easily prevented through frequent brushing, flossing, and trips to the dentist. In order to keep your gums from bleeding again, you will want to brush your teeth twice a day and floss at least once a day. Be sure to have regular check-ups with your dentist for professional cleanings. Here are some additional tips for keeping your gums healthy and free of blood. Limit snacking between meals or brush more frequently throughout the day. Rinse with salt water once a day. Use a soft toothbrush and avoid pressing too hard to brushing too much. Stay away from smoking or chewing tobacco. Bleeding gums are never natural. While cuts or irritation may cause some bleeding of your gums, if you’re frequently seeing a bit of pink in the sink when brushing your teeth, you probably need to take some additional steps to keep your gums free of bacteria or plaque. Frequent check-ups and teeth cleanings with your dentist is the best way to stay on track with your oral hygiene. Through getting proper cleanings a few times a year, you can effectively remove the plaque and bacteria that can cause serious irritation and bleeding. In between cleanings, stay away from foods and unhealthy habits that may contribute to bleeding or plaque build up. Don’t skip brushing your teeth or flossing. With the right approach, you can eliminate bleeding gums and prevent them from coming back. For additional help maintaining your oral hygiene, talk to your dentist for additional tips and tricks.